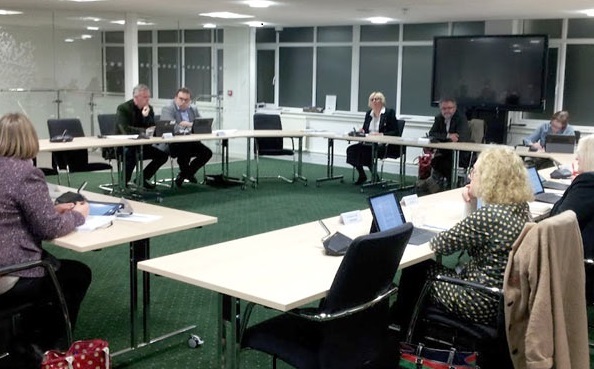 Cllr Andy Patmore, upper left, at the Cabinet meeting, with Cllr Rob Lee on his left and Cllr Peter Chowney, seated in front of screen, who chaired the meeting. These are the reasons I think Hastings Borough Council were wrong to bring the prospect (by means of a feasibility study) of developing a ground solar panel array in our Country Park to Cabinet on Monday 8 January. The idea of developing anything in Hastings Country Park is ALWAYS going to draw attention from the public because it is in the North Weald Area of Outstanding Natural Beauty and most of the park is designated as an SSSI (site of special scientific interest). Although development of this site is within the remit of Hastings Borough Council it must pass a planning application where HBC would have to consult a very important statutory body, Natural England. Natural England have the power to object on environmental grounds and their objection would almost certainly scupper ANY plan to develop on or near an SSSI. My main question at Cabinet was, “Have you consulted Natural England?” The answer was, “No”. Which leads to the logical question of: why would you put an idea out in the public domain without having a chat/letter/email with the statutory body who could really make the whole notion meaningless. Natural England charge a fee for questions but I can guarantee the fee is considerably less than paying consultants to do a “feasibility study”. Cllr Andy Patmore (photo: HBC). The entire idea of putting solar panels in the Country Park is flawed as I see it. This opinion has nothing to do with aesthetics or NIMBYism and it has nothing to do with saving the planet or HBC income generation. If you read Natural England’s publication titled Evidence Review of the Impact of Solar Farms on Birds, Bats and General Ecology, published March 2017, you would have thought it might set alarm bells ringing with regards to photovoltaic (PV) array development near sites of special scientific interest (SSSIs). I quote: “When considering site selection for utility scale solar developments it is generally agreed that protected areas should be avoided. This is reflected in the scientific literature where modelling approaches include many factors such as economic considerations and visual impact but also often avoid protected areas such as Special Protection Areas. This is echoed by organisations such as Natural England and the RSPB that recommend that solar PV developments should not be built on or near protected areas”. The report goes on to say, “Solar PV developments have the potential to negatively impact a broad range of taxa including birds, bats, mammals, insects and plants. In light of this, it is highly recommended that research is undertaken into the ecological impacts of solar PV arrays across a broad range of taxa at multiple geographical scales”. This means that we shouldn’t be building ground solar arrays next to SSSIs without doing a wider national study into how they might be affected. This question is far bigger than Hastings Country Park and I question the Council’s wisdom in bringing this idea forward before a comprehensive national study has been completed. This is not the only Natural England publication which is critical of ground solar arrays near SSSIs. Natural England’s technical note TIN101 states, “The location of solar parks should avoid sites of high wildlife value, in particular, designated sites such as Sites of Special Scientific Interest (SSSIs), Special Protection Areas and Special Areas of Conservation. Any development proposed on land within or adjacent to designated sites is likely to have an adverse effect on the environmental features for which they were designated, in particular during the construction phase”. Of course the move towards renewable energy sources is progressive and admirable, however more needs to be done to understand the interaction between these new technologies and the ecology that they are ultimately designed to protect. For now, in other words, look elsewhere to develop solar arrays other than on or near SSSIs. Leader of the Council Peter Chowney saw the logic in asking Natural England their opinion first and looked as surprised as I was that it hadn’t been done already. He agreed to add an amendment which said HBC would ask Natural England for their opinion before spending up to £80,000 on consultants. But this was only “added” to the flawed recommendation put in front of Cabinet so Cllr Lee and I were unable to support the amendment. Let us hope that Patmore and his colleague in the Cabinet vote against the plans which Chowney and his associates have on the table for the old Bathing Pool site… another pie in the sky Mickey Mouse scheme which is beyond belief…the Cabinet meeting is on 4 February at 6pm – be there to witness how your councillor votes for this unwelcome scheme. And for everyone who would like to see the minutes of the meeting held by residents concerning these plans log onto http://www.westmarina.org – a meeting attended by 5 councillors but which produced no conceptual layout of the development submitted by the developer but suggested the scheme might include 152 houses/flats, glamping huts, artist studios and galleries, childrens paly areas, cafe, water sport friendly facilities and slipway etc. etc. You need to read this to believe it!!!! To start with I am neither a Conservative or any supporter so my credit to Cllr Patmore is not politically motivated. Just common sense form the way it has been presented. It really beggars belief how Cllr Chowney et al has even thought the Country Park would be the place to establish some huge solar panel project. As noted it is an SSSI along with an AONB yet someone – somewhere in this council saw it fit to suggest this location. Any chance we will ever know exactly who it was ? And here we are a sensitive Greenfield location that has been blighted by the Rocklands landslip and that blot on the landscape they call the “Bunker.” The latter I may add thanks to HBC’s planning department – not committee – as it was a delegated decision. Some really pertinent research from Councillor Patmore here. I hope that at least the same degree of research will be undertaken when Amber Rudd next shows signs of supporting fracking. How sad that HBC, who are meant to be the guardians of our Country Park, are the very ones attacking it. We all want to see Hastings succeed, generate income and flourish – but this plan has been unbelievably poorly thought out. Renewable Energy should be something we can all get behind, and there are plenty of sites in town for solar on roofs, warehouses, brown fields. Come on HBC, try to be a bit more imaginative! Don’t destroy the Country Park for short-term financial gain. Although I wholehearted support solar power, I feel that in this case the location is totally inappropriate. The council should look elsewhere for the solar array. Clearly Peter Chowney appears clueless when it comes to our natural environment. Of all the sites to select for a solar farm this surely has to take the biscuit. Apart from anything else, I understand that these ground level panels have to have to be securely fenced so no members of the public can gain access to these installations which carry a high electrical voltage. The requirement to make these installations people /animal proof goes completely against the ethos of our Country park where animals and people are free to roam. How very concerning to hear that Cllr. Chowney didn’t think to consult with appropriate agencies before embarking on yet another so called costly feasibility study. For how much longer can this man remain as Leader of Hastings council?